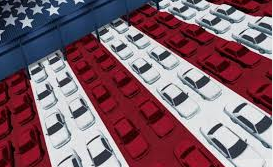 Only Seven Vehicles Are Truly American-Made . . . Really? You'll probably find this hard to believe, but "American-made" autos are quickly becoming a thing of the past unless something changes. As the U.S. auto industry becomes more globalized, fewer and fewer cars meet the standard to be labeled American-made, and today there are only seven that make the list. I found this a bit shocking, so I did some digging to find out just who came up with this list and how are they defining "American-made?" So, why do so few cars make the list? Read the full article by Cars.com here.